My husband and I married in 2007 after dating for over six years. We always planned to try and start a family in September 2008, and we did get pregnant that month. But we never planned for our daughter to be born with an incurable disease. May 15, 2009 we heard devastating news; they found rhabdomyomas on our unborn daughter when we were 35 weeks pregnant. That is when we first heard the words tuberous sclerosis. I remember crying at home that night and my husband said to me “She can feel everything from you. You are stronger than this and she is going to get her strength from you, so no tears, so she’s as tough as you are.” He was right, so I started doing research, met with genetics doctors, cardiologists and had sonograms every 3 days to check on her. They induced our pregnancy three weeks early and admitted her to the NICU. It was so hard to not have your baby in the room with you and having to go down to the NICU for feedings and for the doctor’s rounds. But the hardest was watching the days when babies were not well and they would be crashing right before your eyes. I did not know any of the moms there, but we all felt for each other. Seeing babies that have lived there for four months made you realize that you did not have it so bad. When she was 4 days old a brain MRI confirmed TSC. 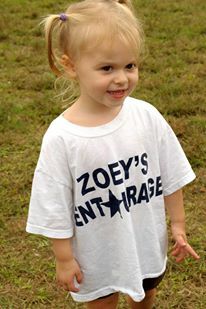 Zoey was born with countless tubers on her brain and a subependymal giant astrocytoma (SEGA) as well. We were told by her neurosurgeon that it is the second largest SEGA he has ever seen, lucky us. Fortunately we were also told that if it ever grew it is operable. Zoey had blood work to find the strand of TSC she might have and at 8 weeks old it was confirmed she has TSC-2. We had Zoey start early intervention when she was 4 months old, one of the greatest decisions we ever made. She was granted physical therapy, and we met Sonny. Sonny was Zoey’s first best friend. He came to our home 3 times a week, and Zoey just loved him. He helped us through all of the hard times. He was there for her no matter what. When we moved from Queens, NY to Long Island, he even followed us. He made sure he found a company that also worked with Long Island early intervention so he could stay with her. He was with us for 3 years, and I cried on his last day. He will always be remembered. Zoey also had speech therapy and occupational therapy at home three times a week. We met Hadiah, a no nonsense OT who always made Zoey work harder and still have fun, and Kelly, her speech therapist ,with whom Zoey fell in love with immediately. Her bubbly personality helped Zoey sit through her 45 minute sessions. Zoey is developmentally delayed; she has been going to school since she was 2. Zoey has a team of therapists and teachers that have helped tremendously. Zoey can wave hello and goodbye, blow me a kiss, give high fives, climb stairs, run, jump and loves spinning to get herself dizzy. These are simple gestures that I thought she was never going to be able to accomplish. While she is non-verbal, we always have hope that one day she might find her voice. Zoey has been through more in her four years of existence than most go through in a lifetime. When she was 6 ½ months old she started having infantile spasms, I remember calling the on-call pediatrician because it was a Sunday, and she told me, oh she’s probably just teething. Zoey would cry, and when she stopped, her arms would go above her head and her eyes would roll to the back of her head while her legs crunched up. I knew it was not teething, so I called her everytime she had a spasm and had an EEG appointment made in two days. Zoey spent her first Christmas Eve in the hospital and started a steroid, ACTH. I had to give her an injection every morning in her thigh. I remember the first time I had to do it at home. My dad came over to help me and hold her leg because I was so scared she was going to move. Lets face it, this steroid was a nightmare. All she wanted to do was eat, sleep and poop. But thankfully, because of the TS alliance, I was able to make contact with a fellow TSC mom, Cindy. She helped me get an appointment with a new neurologist, Dr. Orrin Devinsky, at NYU. He wanted her to start Sabril immediately. I am not even sure if Cindy remembers helping us, or if I ever thanked her enough because with Sabril, Zoey’s spasms stopped after the first dose and she still has to take this medication twice a day. Zoey’s development had worsened after the spasms. She had a difficult time trying to crawl because she had gained five pounds in three weeks from the steroid, but Sonny, our superhero helped her. She was crawling at 9 months and started walking at 15 months old. Then when she was 17 months old, Zoey vomited and turned blue. She was rushed to the hospital, where countless medications were given to her, and even a defibrillator was used on her. I thought we were going to lose our little girl. Once they put a central line in her thigh, the medication finally stabilized her after two hours, the longest two hours of our lives. They diagnosed her with Wolf Parkinson’s White, an extra electric charge in your heart causing dysrhthmia. Zoey spent eight days in the hospital trying to find the right dose and right kind of medication to help keep her heart beat at a normal rate. She takes flecainide and amiodarone still, just to maintain her rhythm. We spent Thanksgiving in Columbian Presbyterian Hospital that year, and you know you’re supported when your sisters and brother-in-law show up with Thanksgiving dinner, crockpots and all. We ate a very thankful meal that year for having our Zoey with us. Well wouldn’t you know it, two days after she was released, Zoey was unresponsive again; we assume it’s her heart and call 911. 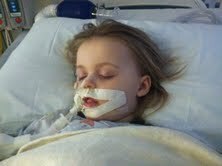 She gets to the hospital, and it’s now seizures… hospitalized again, and prescribed Keppra. Well that month of December 2010 proved to be a crazy one. I stayed with my parents because they live so close to the hospital. That was a good decision because she had a seizure every 2 weeks that she could not get out of; she was hospitalized a total of eight days in December, including New Year’s Eve. Some years are good, and some are bad. Last year, 2012, Zoey had some rough seizures. Zoey never gets out of her seizures. She always needs diastat, an emergency seizure medication, to stop the seizure. But then she has shallow breathing so she needs to be intubated…that happened six times last year. 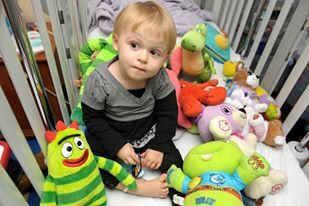 Most of Zoey’s seizures have been febrile as her immune system is slightly weakened, since she is on a newly FDA approved drug called Afinitior, a chemotherapeutic drug. Afinitor is prescribed to try and shrink a TSC person’s SEGA. Zoey’s SEGA has shrunk and is now stable. Her doctor said that she still might need brain surgery one day because of how large her SEGA is, but for now, thanks to the medication, she does not need to have any surgeries. We also had her start a vitamin, probiotic, and that seems to help her fight off any illnesses she might receive. While my husband and I never planned to have a special needs child, we do. Now we just try to keep our sense of humor about everything, and realize she is the strongest person we both know. I mean when you get a needle stuck in your arm to take blood for the umpteenth time, and you just look at it, and then just start playing with your iPad like the needle is not there, that’s pretty amazing for any child. Zoey is also one of the happiest kids you would ever meet. She is always smiling, laughing and hugging everyone. Everything she goes through has not changed her demeanor. She refuses to let TSC run her life and chooses to just be happy. Her outlook on life has helped us keep our sense of humor and live everyday to the fullest. I like to find the humor in the fact that you never thought you would be writing her teachers asking if she had any bowel movements because of how constipated she gets from her medications. Or your mom texting you that her poop was “hard like little nuggets, I gave her some prunes.” But it’s humorous and gets me through the hard days. Nurses have also told us that we are the calmest parents they have ever met. We have learned in Zoey’s 26 hospitals stays to just kind of stay out of the way, let them do their job and when she is stable you can hold her hand and lay with her. We remember a nurse saying, “You guys are amazing. I mean you are sitting here watching and just waiting patiently, when we have moms here who have a kid that stubbed a toe and they are freaking out.” See, humor gets me through these times. August 12, 2013 from 6PM-11PM. Just $10.00 entry fee, for a fun time, with live music, raffles, Chinese auctions, food and a cash bar. 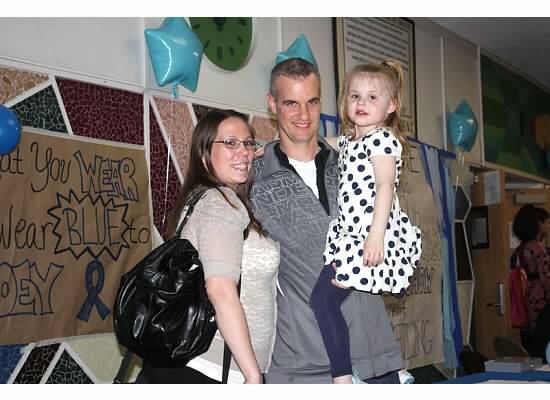 Our family will always raise awareness and give everything but up in trying to find a cure. Zoey has had seven MRI’s (so far), been intubated six times, has had 14 EEG’s, and too many blood tests to count, but she gets up from all of her procedures with a smile on her face. So we just take it one day at a time. Some days are harder than others, but Zoey does not let that bring her down. She gives the greatest hugs in the world and is our warrior. I can listen to her laugh all day long. So no pity party please; we are way too busy laughing, hugging and smiling the day away.